Ecodesigns Northwest, Publishers, 9780963291295, 276pp. 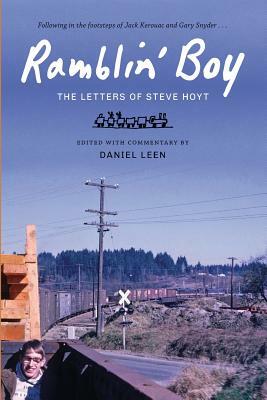 RAMBLIN' BOY WILL BE RELEASED IN JUNE OF 2016- PLEASE CONTACT THE AUTHOR FOR REVIEW COPIES IN THE MEANTIME-daniel.leen@yahoo.com I first met Steve Hoyt in the early sixties when we were in Junior High, and by our senior year of high school we were hopping freight trains together, searching for adventure to offset the boredom of school. In the mid 1960s however, most guys either went to college or joined the military but Steve decided to ride a bicycle across Europe to a small village in Norway, where he spent the winter working on a fishing boat on the North Sea. After being called back to the States by Uncle Sam, he reluctantly enrolled in college-- the alternative at that time for healthy young men was to be shipped to Vietnam for combat. While in college, inspired by the literature of writers such as Jack Kerouac and Gary Snyder, he yearned to be on the road again. Between terms he was able to escape what he termed "four walls education" to experience the education of the open road: hitch hiking and riding freight trains across America, fishing in Alaska, working on local farms, climbing mountains in Washington's rugged North Cascades, and sailing the waters of Puget Sound. By the early '70s he had dropped out of college, began building wooden boats, and was one of the founders of Bellingham's co-op gardens. As he was developing a deeper awareness of his ecological relationship to the Pacific Northwest, his life was cut short just before his 25th birthday. This is Steve's story, as well as a personal history of a pivotal period in America, as told through his letters, and the memories of his friends. Additional sources drawn upon in this first hand account of the tumultous 1960s include periodicals of the time, photographs, and the travel journals of author/editor Daniel Leen. Daniel Leen was born in Seattle and has lived and worked on the west coast of the USA for most of his life. After studying Anthropology at Beloit College (WI), he hitchhiked to Alaska in 1969 and built a log cabin, and then spent a few years in central Alaska to experience wilderness living. In 1972 he moved to the British Columbia coast where he built a 32' trimaran, living aboard it while exploring the west coast for the next dozen years. He has worked at a number of archaeological excavation projects on the west coast and has also conducted inventories of prehistoric rock art (petroglyphs and pictographs) in remote areas of the BC coast, Hells Canyon, and the Harney Basin in eastern Oregon. He also spent four seasons manning fire lookout towers in the Pacific Northwest, including Jack Kerouac's Desolation Peak, as described in The Dharma Bums. Since the mid 1980s he has been based in Seattle, working part time at Pike Place Market while pursuing his interests in the American hobo, Northwest Coast art and culture, and prehistoric rock art. His previous books include The Freighthopper's Manual for North America, a descriptive analysis of how hobos travel and work during the period following the second World War. He has also published articles in Co-Evolution Quarterly, Seriatim, and monographs on prehistoric rock art in archaeological journals. His latest book, Ramblin' Boy covers the period from 1962 to 1972, and is partly a coming of age story of three close friends who spent those years trying to find their place in the world during a time of great change in America.